I know it’s a bit early for most people to be thinking about Valentines, but us handcrafters need extra time to get our swag together. I’m thinking of doing a line this year of “I love you like X loves Y” cards — some, like this one, of the dorky fangirl variety, and some of a more geeky bent. 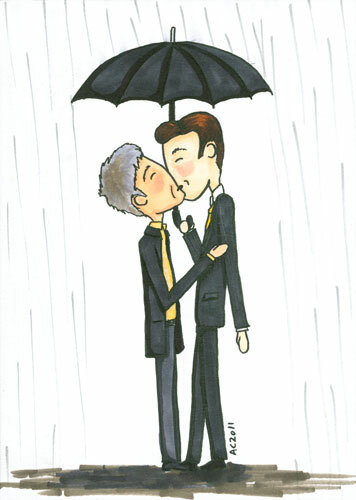 Plus, the image of Mycroft smooching his DI under his favourite umbrella was one I just couldn’t resist. Like Mycroft Loves His Umbrella, 5″x7″ pen and ink and Copic markers on paper. Get cards and prints at Etsy.